HOME | indie blog | pillow fight! Fun & fantastic, Toddy Sleepwear is a new label with some irresistible designs! These onesies and such have been designed by Melbourne's Michelle Legge and are 100% Australian made, using the softest Australian cotton/lycra fabric (and featuring Michelle's original prints). With a bed bug for a logo, unisex designs, and even a bum flap in the signature onesie or "Toddy Suit", Toddy offers an offbeat alternative to the mainstream fare. Michelle sees the Toddy Suit as the ultimate winter pajama - "a practical winter garment and a quirky talking piece rich in retro-culture, the ideal combination for both the comfort and fashion conscious." The Winter 2008 collection is titled "Log Cabin Lullaby". 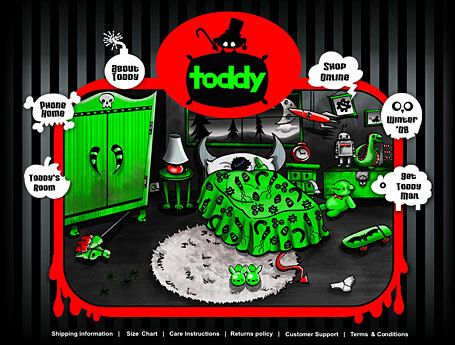 Prepare to be surprised & delighted as murky monsters, bacteria bugs and forest freaks creep out from under your bed... you'll sleep safe & sound in a snugly Toddy Suit for sure! Completing the Toddy range is a series of sleepwear staples, each treated with a unique design twist to keep things interesting. In keeping with the retro children's pajama theme, Toddy also offers matching PJ sets consisting of lusciously long rib-trimmed leggings and quirky shoulder buttoned long-sleeve tops plus the usual suspects like boxer-style shorties, racer-back singlets & cosy cap-sleeved t-shirt nighties. Toddy Sleepwear is available from the Toddy web site at www.toddy.com.au, where you'll also find size charts, plenty of cute pics, and... your perfect pajama, of course! So get back in the spirit of pillow fights and bed time stories & make Toddy the perfect excuse to sleep in on a winter weekend!